A judge in Maine has ruled that a Gardiner man is not competent to stand trial for allegedly cutting his father into pieces last May. Leroy Smith, 25, is accused of dismembering his father, Leroy Smith II, 56, in the apartment the two men shared. Police say Smith placed his father's remains in garbage bags and disposed of them in the woods in a nearby town. But Smith's attorney, Pam Ames, says mounting a defense on the murder charge has been impossible. "He thinks our role is to subpoena society and to subpoena heavy metal bands to figure out why he can't play with them," said Ames. 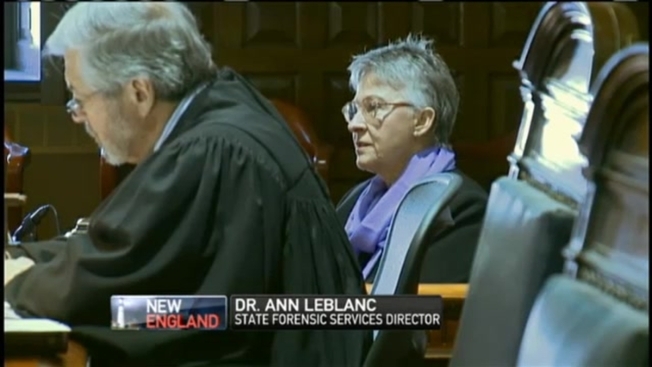 At Smith's competency hearing at the Kennebec County Courthouse, the Director of the State Forensic Services, Dr. Ann LeBlanc confirmed that after 10 meetings with Smith, she's confident he does not understand his lawyer's role. "I think the complicating factor is that his overall mental status is completely contaminated by delusions," LeBlanc told the judge. LeBlanc said Smith told her he was the best guitar player in the world and that he wanted his lawyers to summon other famous heavy metal guitar players so he could tell them he was God. LeBlanc says Smith suffers from severe psychosis. "His presentation is absolutely consistent with paranoid schizophrenia or delusional disorder," said LeBlanc. If the official diagnosis turns out to be schizophrenia, Smith could be treated with anti-psychotic medication, but so far he has refused medication, because he believes he is sane. Following LeBlanc's testimony, the judge ruled Smith incompetent to stand trial. He will be sent to Riverview Psychiatric Hospital for treatment which may include requiring him to take anti-psychotic drugs. But for now, the prosecution is no closer to understanding what led to the bloody scene inside the Cannard Street apartment last May.